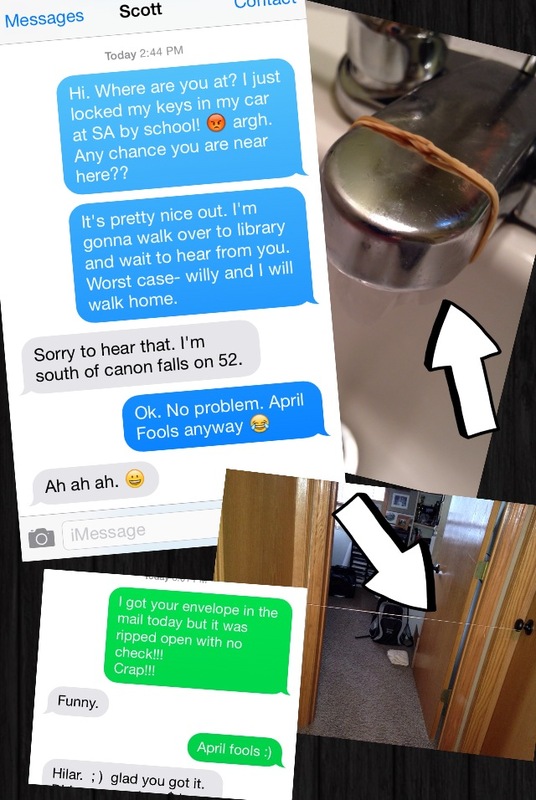 April fool’s…sort of. Ok… so, we don’t exactly know when…but, we know it WILL happen! I’ve found great joy in texting with friends and family today trying to fool them. It’s fun to watch and hear the joy and giggles spread around, too. I found myself driving in the car laughing out loud to myself while I wondered if Vinny would be a prankster or not. Right now I could see him going either way. Will and I will try our best to influence him to the dark side. I tried it out again today… Scott believed me- he says it’s because I have a little bit of a history with this kind of thing. 🙂 But, I did get him. Again. I’ve giggled a lot today- how about you?! Hilarious!!!! Glad you had a fun day!! Love you, Mom PS> missed the water in my face today!!! !